Once again, I've been remiss at getting my posts up, and I'll really, really, really try harder to do so from now on. Summer has been here; and although I have been painting regularly, I've also been busy with gardening, playing with my granddaughter, visiting with the rest of my family, attending Portland Saturday Market regularly now! Well, as you can see, I've been busy. 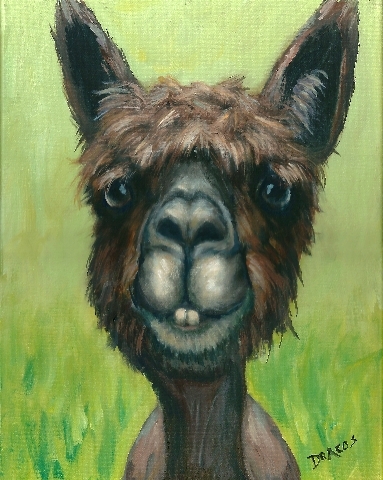 If you have any photos of farm animals that you wouldn't mind if I use for paintings, I would really appreciate it if you could send some to me, dottiedracos@gmail.com (my new email address for the time being at least). I'll give you a free 8x10 print of the painting if I do use one of your photos. Back to work now on my latest painting, a long-haired dachshund that someone at Portland Saturday Market graciously allowed me to photograph and paint. He's a beauty; can't wait to see how he finishes up.